Fans of Disney Infinity 3.0: Play Without Limits can unlock more hours of game play with two new Toy Box Expansion Games - Toy Box Takeover and Toy Box Speedway - now available in South Africa. The Toy Box is where players have the freedom to choose from a variety of game play options and create their own style of play using any character figures from their collection. The Toy Box Expansion Games further extend that experience with multiplayer structured game play where families can play together, mixing and matching some of their favorite Disney, Star Wars™, Marvel, and Disney•Pixar characters. 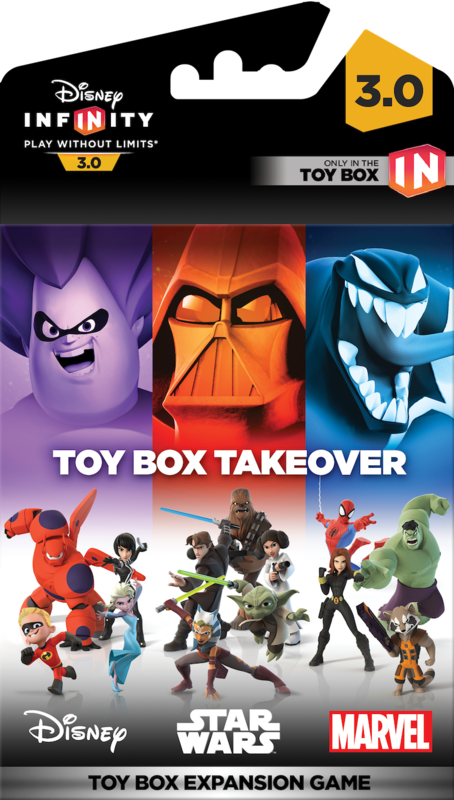 Toy Box Takeover is an action-adventure game that features multiplayer game play allowing players to use all of their favorite Disney, Star Wars™, Marvel, and Disney•Pixar characters. Using their favourite characters in Disney Infinity, they must battle across multiple worlds, such as Pirates of the Caribbean, Marvel’s Upper Manhattan, The Old West, or The Incredibles Volcano Lair to defeat the bad guys before they ruin the Toy Box forever. Toy Box Speedway is a kart-racing game that will allow fans to see who truly is the fastest of all vehicles and characters. There are nine franchise-themed tracks to choose including Sugar Rush, Frozen, Tatooine, a classic Star Wars location, San Fransokyo, Agrabah, Monsters Inc., Halloween Town, Gravity Falls and Marvel’s Knowhere. Players also get to choose three different game modes including Time Trial mode, Race mode and Combat mode. Players put their driving skills to the test as they attack opponents with gadgets and weapons and earn trophies across three challenge cups. 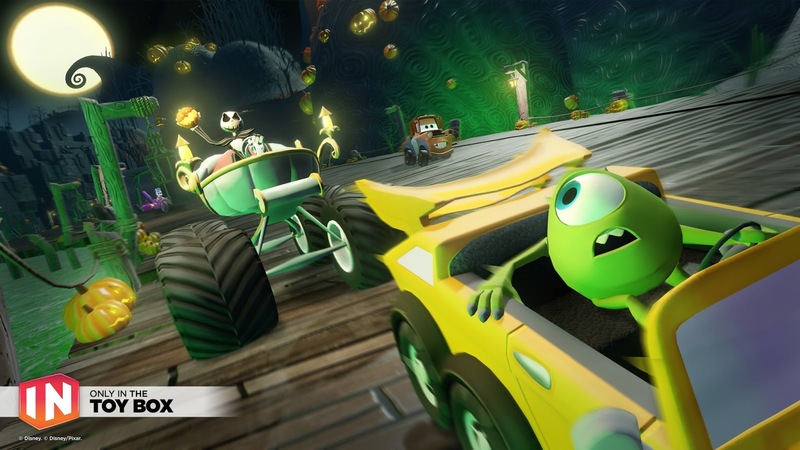 Disney Infinity 3.0: Play Without Limits Video Game and Base are required to play the Toy Box Expansion Games. Disney Infinity 3.0 is the latest installment in the highly successful Disney Infinity “toys-to-life” franchise, introduced to South Africa in August 2015. The Disney Infinity 3.0 Starter Pack, which includes the Star Wars Twilight of the Republic Play Set, is currently available in major South Africa retail stores for the PlayStation®4 and PlayStation®3 computer entertainment systems, Xbox One and Xbox 360. 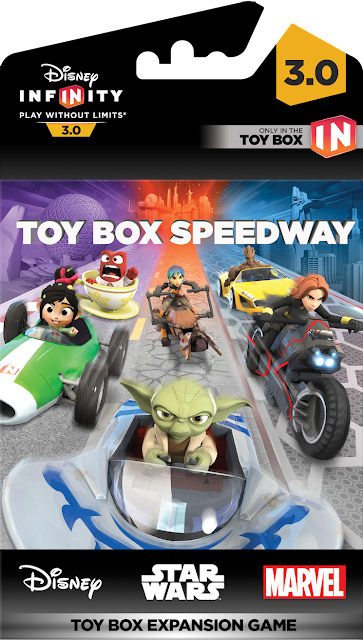 Toy Box Takeover and Toy Box Speedway will be sold separately. Looking forward to play the same as soon as possible.